Click the image to view full size screenshot. The software license is Freeware, feel free to use it, but do so at your own risk. The ISO image file is a popular image of the CD/DVD discs, an ISO file can include all the content on the disc, this software can easily burn these ISO files to a USB flash disk, makes it easy to carry and use. The program's interface is very simple, you only need select the ISO file you want to burn and the target USB drive, then click "Burn" button, an USB disk that includes all ISO image data will be created. There do not have any complicated settings, it is easy to use very much. 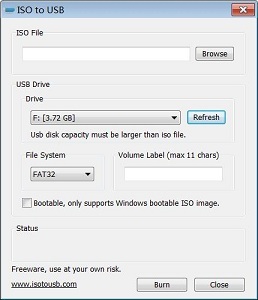 This program have be tested with Win8/Win7 PE and WinXP PE bootable ISO image files, it can work fine, the generated USB disk can normally boot the computers. Only a small part of the machines can boot Win8/Win7, but can not boot WinXP, these machines will display "NTLDR is missing", for this problem there is no good solution currently. (a) For Win8, press keyboard "Windows key" + X together to open the Quick Access Menu, select "Disk Management". (Or, from Windows 8.1, users can right-click on the Start button to bring up this quick access menu). (b) For Win7/Vista, click "Start", and then click "Control Panel", in the "System and Security", click "Administrative Tools", and then double-click "Computer Management". In "Computer Management" console tree, expand "Storage", click "Disk Management". (c) For WinXP, click "Start", and then click "Control Panel", in the "Performance and Maintenance", click "Administrative Tools", and then double-click "Computer Management". In "Computer Management" console tree, expand "Storage", click "Disk Management". In "Disk Management", right-click your USB disk (unallocated space), and then click "New Simple Volume", the "New Simple Volume Wizard" should appear, step-by-step, that is all. Copyright © 2011 ISOTOUSB.com, All rights reserved.